You are currently browsing articles tagged Donald Cargill. Challenged by his land owner father to become a minister, Donald Cargill resisted the suggestion at the first. His inclination was not the gospel ministry. Finally, with what his father had put into his hand and heart, young Cargill at last set aside a day to prayerfully consider whether God was calling him to this ministry. It was said that a text from Ezekiel came into his mind, “Son of man, eat this roll, and go speak to the house of Israel.” Then when Presbytery chose the same text from Ezekiel during his trials, there was no doubt of his divine calling to the ministry. His first charge was that of the Barony Church in Glasgow, Scotland, which charge would take his time and talents from 1655 until 1662. The church was divided in Covenanting groups and non-Covenanting groups of people. No one can abide long in such a divided congregation without receiving the wrath of one group or the praise of another. All this changed however in 1661, upon the restoration of Charles, when Donald Cargill delivered a sermon before a great crowd. He said in part, “the king will be the woefullest sight that ever the poor Church of Scotland saw. Woe! Woe! Woe! unto him, his name shall stink while the world’s stands, for treachery, tyranny and lechery.” Obviously, this was not a statement which would bring good relations between the Crown and his place as pastor in Scotland! And indeed, before a week went by, government soldiers were out looking for him, and he had gone into hiding. His ministry from that point on until his capture by the Crown was that of witnessing before small groups of men and women. From 1668 on, he became a traveling evangelist for the Gospel, escaping death and destruction by many a close call. To be sure, he showed bravery and courage in many a situation. In other cases, he was weakened and oppressed by lack of assurance. On one occasion, a great crowd was present to hear the word of grace from his lips. But in addition to that Word came words which amounted to a curse upon his persecutors. He said, “I, being a minister of Jesus Christ, and having authority and power from Him, do, in His name, and by His Spirit excommunicate, cast out of the true Church, and deliver to Satan, Charles the Second . . . The Duke of York, the Duke of Monmouth, the Duke of Lauderdale, the Duke of Rothes, General Dalziel, and Sir George MacKenzie. And as the causes are just so being done by a minister of the gospel, and in such a way as the present persecutions would admit of, the sentence is just. And there are no kings or ministers on earth who, without repentance of these persons can reverse these sentences. God, who is their author, is more engaged to the ratifying of them: and all that acknowledge the Scriptures ought to acknowledge them.” There is no doubt that such words were inflammatory and some even questioned and criticized such talk. Yet all those he mentioned here in his curse did die in strange ways. As Calvinists, we see no place for coincidence in the realm of persons, places, and events on this earth. 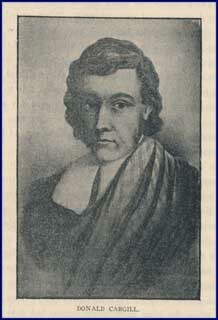 Image source: Sketches of the Covenanters, by J.C. McFeeters (Philadelphia, 1913), p. 298. “For here we have no continuing city, but we seek one to come.”—Hebrews xiii.14. In vain would we hope to bring men to a course of godliness, considering how averse the flesh is to it, and in vain would we deal with ourselves for that purpose, if great and real advantage lay not in taking that way. Whatever the flesh objects as to disadvantage, yet there is no real disadvantage in a religious life; yet, there is more advantage in this course, than will make up for all other disadvantages. It were good that we were considering what advantages there are in this way, and comparing our advantages with our disadvantages. It would gain our affections to it, considering that our Lord is calling us to leave all that which at last will prove our eternal ruin. As for anything lawful, He is not calling us to leave that; but we are not to idolize, or make a god, as it were, of it. Consider what He is calling us to pursue. It is that without which we cannot be eternally happy. 2ndly, There is the employment of those that leave it. How are they taken up? They are as travellers going from one place unto another, until they at last come unto their long abode, or resting-place, which is heaven. I. That man’s continuance on earth and enjoyments of earthly things are but for a short time. II. That the consideration of this short time on earth should take our hearts off from earthly things, and set them upon Christ only. IV. That all should be seeking after Christ and that city of eternal habitation of rest. 1. The first thing which we proposed to speak unto, was, that man has but a short time or lease on earth. The Spirit of God points it out by sundry expressions, “Lord, make me know mine end, and the measure of my days.” And what is the answer: “Behold, thou hast made my days as an hand breadth,” yea shorter, “and mine age is as nothing before thee.” Says Moses, when speaking of man’s life, “They are like a sleep; in the morning they are like grass that groweth up, and in the evening it is cut down, and withereth.” Our days are but as a thought; nay, the Holy Ghost points them out to be shorter: “For what is your life? It is even a vapour that appeareth a little, and then vanisheth away.” It is rather a vapour than a reality. It is but a vapour that continueth a little time. And doth not experience prove all this? Are we not here to-day and away to-morrow? The great thing we ought to consider is, that our time here is but short—a truth seldom minded and more seldom laid to heart. (1.) To consider our ways and what belongs to our peace. It is a good advice that Solomon gives us: “Remember thy Creator in the days of thy youth, before the evil days come;” and yet the most part of us, for all that is spoken from the word of the Lord concerning the shortness of man’s life, think not that our time is short, but long enough, and so remember not that the evil days are coming upon us. (2.) We lie down, and know not if ever we shall rise up again. Should we not then improve our time? For is there any person so certain of his life that he can say, “I shall live so long”? And is it not of God’s good providence that it is so short and so uncertain unto us? (3.) Consider that it is not only short and uncertain, but also full of trouble and misery. And is it not enough for every person? What is dying and a decaying old age but labour and misery? And should not this be considered and laid to heart, that our life is not only short and uncertain but full of misery? And should not the time we now have be well employed on that account? (4.) To incite you to employ your time, consider that the time is short and the task is great. Are there not many strongholds of sin and corruption to subdue and conquer? Hath not man a little world to subdue in his own heart? Now, lay these two together, that your time is short and your work great, and this may make us employ and improve it to the best advantage. (6.) Consider that eternity is fast approaching, and our Lord Jesus is coming to judgment. His last words are, “Surely I come quickly.” And is Christ hastening? Should not every believer then be hastening to meet Him? If believers loved Christ as well as He loves them, they would be more hasty to meet Him. It is a wonder to see what we are employed in, and yet never employing our time aright. Lastly, Consider that the Bridegroom is coming, and the bride must be prepared. It ought to be all our work, or talk here, to be ready to meet Him, that we may not be found unprepared. Oh, what a dreadful thing will it be to be found unprepared when Christ comes—when the midnight cry is made, “Behold the Bridegroom cometh, go ye out to meet Him”!